CATHOLIC GIFT SHOP LTD - Lourdes Wooden Cross Wall Plaque Gift Set. Lourdes Wooden Cross Wall Plaque Gift Set. Gift set for Christmas contains:. > A bottle of Lourdes water, bottle measure 5 cm approx. 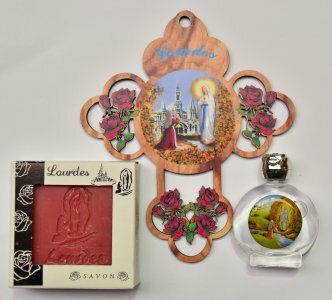 > Lourdes wooden cross wall plaque with red roses and a depiction of the apparitions carved into the cross. > A 100g bar of strawberry scented soap - made in Lourdes.